North Austin residents who spoke with canvassers from the Chicago Teachers Union (CTU) gladly signed a petition calling for a moratorium on school closings and turnarounds. Several residents of the area surrounding Lewis Elementary School, 1431 N. Leamington, also requested that the CTU call them to testify against any disruptive school actions at a February 28 community meeting with CPS CEO Barbara Byrd Bennett. 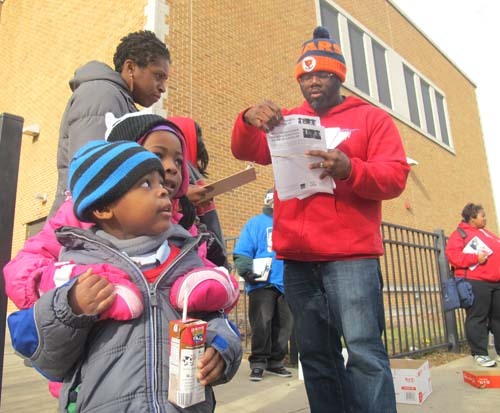 CTU organizer Brandon Johnson passes out leaflets and petitions to canvassers at Lewis Elementary, 1431 N Leamington Ave., before they walked the neighborhood on January 19. While a few people did not open their doors, others welcomed the canvassers inside their homes and spoke of their children and grandchildren attending Lewis. They emphatically said they did not want to see the school closed. Canvassers also met with the North Austin residents on sidewalks, in the LaFollette Park field house, by businesses on North Avenue, and outside the school, where parents were picking up their children from Saturday school. Some Lewis school seventh and eighth graders signed petitions at the McDonalds at North Ave. and Laramie. CTU organizer Brandon Johnson led the effort at Lewis School, one of seven gatherings of teachers, parents, students, and community activists across Chicago on Saturday. Johnson said that more than 20 canvassers who left at 11 a.m. returned at 1 p.m. signed petitions. "Nearly everyone we talked to signed the petition," Johnson said. "People are receptive. There is a deep history with the neighborhood schools. Folks recognize the institutional stability of the neighborhood schools." Johnson had explained the context of the event in a Facebook post on January 18, inviting Westsiders to meet him at Lewis. "Dr. King left us with a clear path to educational justice, we shall not be moved!" Johnson said. "The mayor and Board of Education closed or disrupted 17 schools communities last year, targeting Black and Latino neighborhoods. These closings take resources that students deserve, destabilize our neighborhoods, and increase racial inequity. The Board is now planning to close dozens more schools in part to pay for corporate handouts and more charter operations controlled by the politically connected friends of City Hall. Our children deserve better." 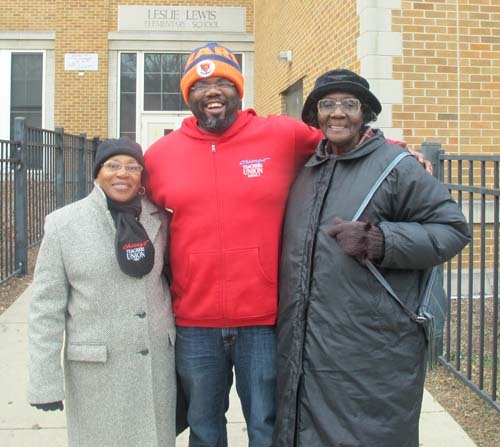 Chicago Teachers Union retiree members Portia Ball and Roberta Wilson with Brandon Johnson after the canvassing in the Lewis School neighborhood. "We’re out here with the struggle," Wilson said. "We’re always here. "Teachers, PSRPs, parents and children, Steven Ashby, labor studies professor at UIC and part of the Teacher Solidarity Campaign, Action Now's Ellyson Carter and Joseph Pughsley, and retirees were part of the team at Lewis. "It was a great work," Johnson said. "People need information." The January 19, 2013 action was one of seven local area organizing activities scheduled by the Chicago Teachers Union and the union's community allies for the Martin Luther King Jr. weekend. The actions are in preparation for the widespread opposition that will take place when Chicago Public Schools Chief Executive Officer Barbara Byrd Bennett finally announces this year's listing of schools to be closed (and otherwise radically changed). The annual list has become known as the "Hit List." Because Byrd Bennett was able to get the law changed for one year, this year the Martin Luther King Jr. organizing took place without the public knowing which schools were targeted for 2013. Last year, CPS was required by law to produce a list on December 1, but the law was changed for one year when Byrd Bennett, who became CEO in October, claimed she didn't have the time to do the review necessary. She appointed a "Commission" to hold hearings and make recommendations. At the time of the 2012 organizing against the 2012 Hit List, Jean-Claude Brizard was CEO of Chicago Public Schools and many of the city's leaders, including Mayor Rahm Emanuel, did not believe that the CTU would be able to get the legally required 75 percent vote of all the union's members to strike. That was proved wrong, and the Chicago Teachers Strike of 2012 began on September 10, 2012. The strike received widespread support form parents and community leaders, and few teachers crossed the union's picket lines. Following the strike, the Chicago Board of Education got rid of Brizard, who had been hired from Rochester New York in May 2011. The Board put Barbara Byrd-Bennett, who a year ago was working in Detroit's public schools, in Brizard's place. The Board supported Byrd Bennett's claim that she didn't have the time to hold hearings and generate the 2013 list according to the school facilities law. ? Great reporting. Why not join...? This story is an example of the high quality reporting that we're proudly publishing every day at Substance. Substance reporters work from a unique perspective, so it's not for those with a Race To The Top or Atlas Shrugged notion of reality. But as the new year lurches forward, we are looking forward to training a dozen new reporters to cover the hundreds of amazing stories we expect to try to get here in the months ahead. To learn more about Substance and our reporters, you can go through "Back Issues" (see the menu bar above). To learn more about reporting for Substance, contact us at Csubstance@aol.com. A reporter is someone who is there and gets the facts. "Writers" are welcome, but reporting doesn't require Shakespearean skills.